Dr. Donald Hersh, the inspiration for the CLEI Center for Keratoconus, passed away on March 20, 2014. A doctor dedicated to the care of keratoconus and contact lens patients and a leading innovator in contact lens therapeutics over the decades, Dr. Hersh will be sorely missed by all of us at CLEI and and his patients. A true pioneer in contact lens development, Dr. Donald Hersh began undergraduate studies at Rutgers University, completing his undergraduate degree at Columbia University. Graduate studies continued at Columbia's School of Optometry, from where he earned a Master of Science degree. He received his Doctor of Optometry degree at the Philadelphia Optical College. Throughout his professional career Dr. Hersh was involved in the research and development of new contact lens technologies. Most notably is the invention of the Hersh Palpebral Traction Lens which facilitates tear flow in patients with inadequate tear circulation or dry eyes. In addition, he was one of the early investigators in the use of monovision contact lenses for improvement in reading vision in older patients, as well as the study of optics and visual function in keratoconus. After many years in private practice. Dr. Hersh joined the Cornea and Laser Eye Institute and its Center for Keratoconus in 1995. He concentrated his efforts on specialized contact lens fittings and was an expert in caring for keratoconus and other corneal diseases, and for fitting patients after other eye surgeries (most notably LASIK and corneal transplants). 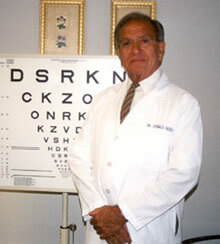 Dr. Hersh was one of the first diplomates of the Cornea and Contact Lens section of the American Academy of Optometry. He was past president of the New York Academy of Optometry. For years, he directed the contact lens service at Rutgers New Jersey Medical School, teaching years of residents the art of contact lens treatments. Dr. Hersh also founded and directed the DIvision of Applied Optics at Rutgers, a think tank dedicated to the development of new sight restoring technologies. I've had keratoconus all my life. Finally, at age 41, I visited The Cornea & Laser Eye Institute and was treated by Dr. Donald Hersh. I was professionally treated by staff and doctors and left with a comfortable, warm feeling after I learned that Dr. Hersh would be fitting me with a corrective lens. Today, I see my wife and 3 children without blurry, shadowy flat vision. I see detail, lines, distance, texture, depth, and color great. I saw snowflakes and swirling water for the very first time. I can finally perform my job without squinting or having to zoom everything up to 140% on the PC. The gift of vision is fantastic and I am truly grateful for the gifts God has given to Drs. Donald and Peter Hersh. Thank you so much!! !